Hampi is an ancient site that once used to be the royal capital of the Vijayanagar Empire. Known as the 'city of ruins', Hampi is a small village in the northern part of Karnataka. Hampi is regarded as one of the most beautiful towns in Karnataka. 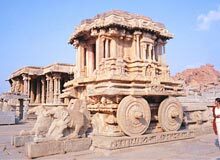 Located near Hospet, Hampi is easily accessible by regular tourist buses from the major cities and towns of Karnataka. Hampi, the village is upkeeping the religious roots that were sown by the Vijayanagar rulers in the form of its temples.